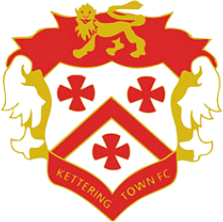 "All of Kettering's dreams came true this season as they defied expectations suggesting that they would be relegation certainties and instead mounted an almost unbelievable title-winning campaign." League Table - It was very tight title race all the way but in the end we clinched the title. 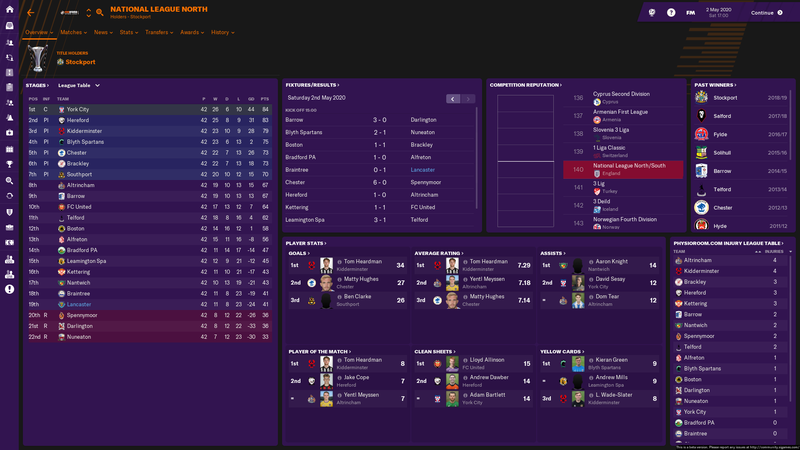 We faced Hednesford last day of the season and win would guarantee us the title and promotion. I was very nervous but boys did their their job marvellously and we won 4-0. 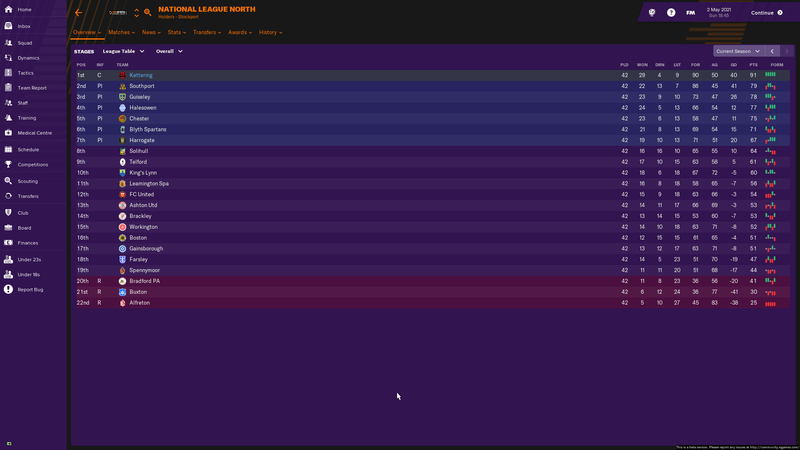 It wasn't smooth sailing all the way and most of the season we were out of the playoff places. However we were unbeaten in the last 20 games and that was enough. Cups - We enjoyd fairly solid cup runs. 2nd round of the Fa Cup was obviously the highlight. Transfers - Decent amout of business here. One loan signing from Oxford and another from our new senior affiliate AFC Wimbledon. Rest of the boys had succesful trials before joining. 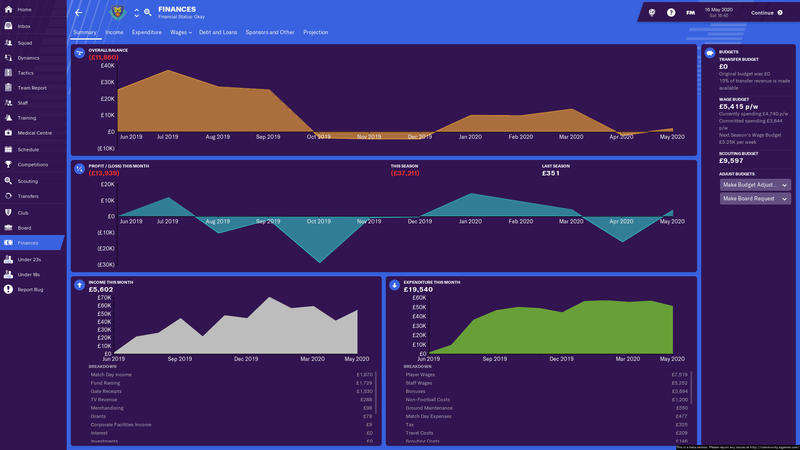 Finances - Despite overspending on wages most of the season we made pretty good profit. Fabio Lopes scored 27 goals in all competitions and was our top scorer. Jonah Ayunga joined us in January and was very solid. 12 league goals in 18 starts. Steve Cattermole midfield dynamo. I assume he was part of the very first Kettering's youth intake. He bossed midfield and developed very nicely. Unfortunately his contract is running out and he isn't interested in renewing. Next Season plans: Strengthen the squad and achieve solid midtable finish. Board also announced plans to expand the stadium which is exciting. Hope this works now. I messed up editing several times already. Took over the job at Scarborough with a predicted finish of 21st, 1001/1 odds of winning the title. 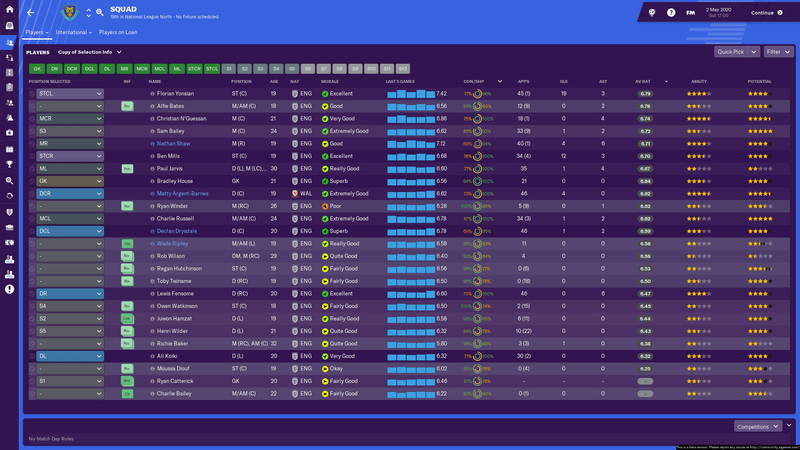 The first thing was getting my tactics for the team and signing some players to fill a lot of gaping gaps in the squad. My first signing was Mattie Bancroft (GK) by accident. 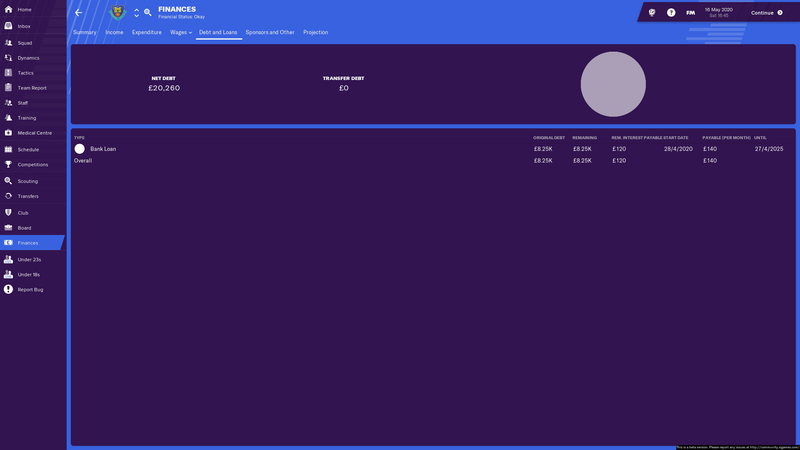 Didn't realise i had my chairman set to handle transfers. So i quickly made sure i was the one to handle everything at this club. 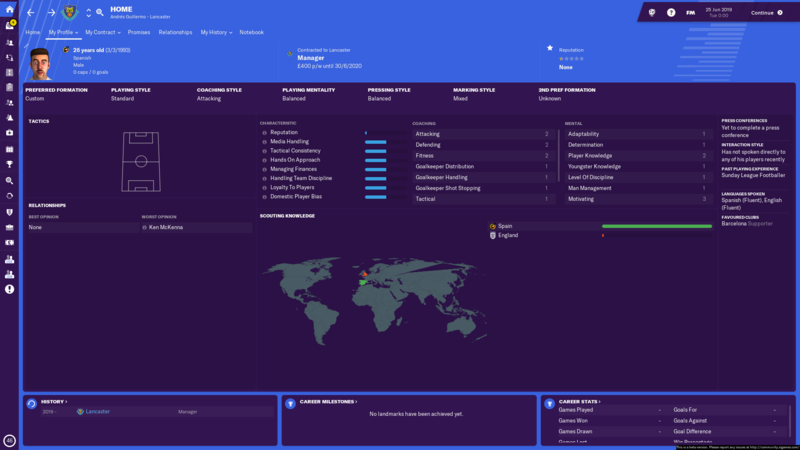 In pre season i brought in 3 players of my own, James Brighton from Kettering (DL/AML). Andrew Scott and Joel Phillips on loan from Accrington and Chesterfield respectively. I went for a 4-14-1 DM Wide to start off with and had a mixed bag of results in my pre season friendlies but wasn't worried as i just used this to settle my squad into my tactics and gauged who was going to fit into my system. Coming into October ish i made the decision of trying to fix my goalscoring problem with a change of formation to the tried and true 4-4-2 made what would be the stars of my season by signing Fraser Murdoch (ST) and Gavin Scott from Curzon Ashton for a combines fee of 9K. I also brought in handy squad players Jake Dunwoody and Paul Konchesky on free transfers. Fraser Murdoch ended the season with 18 goals and carried the goal scoring pretty much alone with mids chipping in here and there. Gavin Scott ended the season with 7 goals 3 asissts and a average rating of 7.14. At this point in December i was questioning my switch to 4-4-2 with 2 wins 2 draws and a defeat but this thought was quickly squashed when we won 7 straight in January and quite remarkably we were someone in the race for the title with Kidderminster. 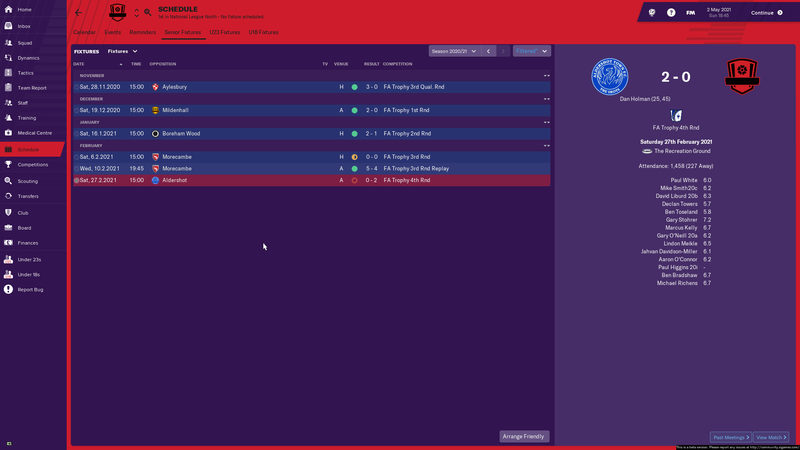 In march the title race was alive and well with only 3 points in favour of Kidderminster, In the last month we started with a draw away to Kidderminster and then won 4 straight to win the league with 2 games to play. Nothing much to write home about with the cups, Made the 1st round of the FA trophy and second round qual of FA Cup. 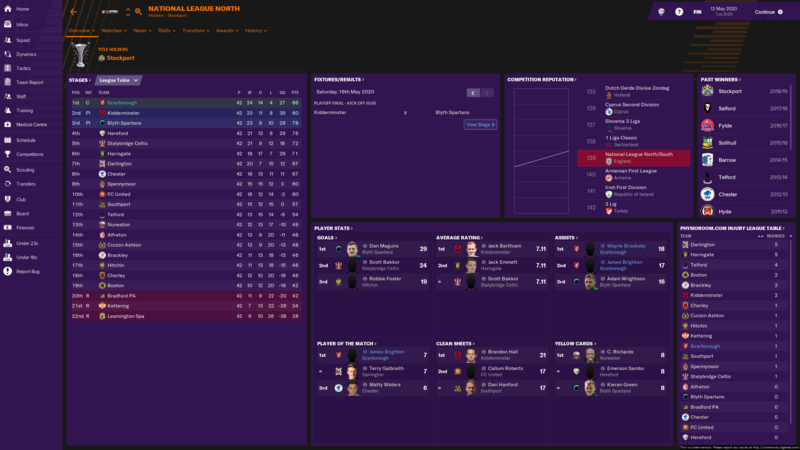 Thanks for taking the time to read this, and here is a screenshot of the final league table for any who want a gander. Forgot to upload screenshot. First time doing this save. Lets see how it goes. Well done everyone on progress so far, especially those of you winning the league. Although, you have just cranked up the pressure on the rest of us. Still in pre-season on my save but I'm prepared for a few seasons of struggle until things click. I never hit the ground running with my tactics! The team started off slowly with a lot of draws, not winning until the 11th league game although 7 had been draws. Tweaking the tactics led to the team moving up the league and with 10 games to go the team moved into the playoffs. 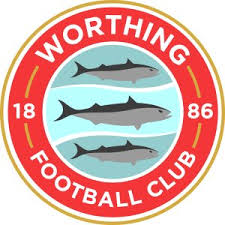 Unfortunately the team lost form and the playoff hopes were ended in the 2nd last game being thrashed by club rivals Whitehawk 5-0. No progress in the cups, easily beaten2-4 at home by lower league Weymouth in the FA cup. In the FA trophy Maidenhead went down to 10 men after 27 mins but scored 3 by halftime. Full out attacking for the 2nd half only got the score back to 2-3. 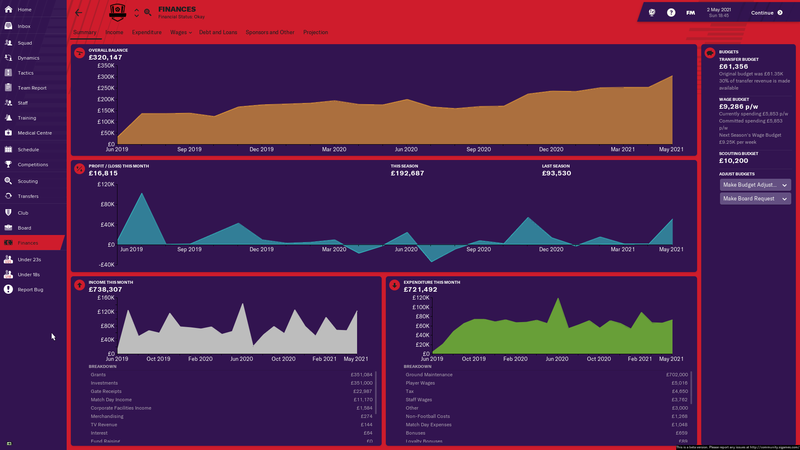 The finances stayed quite level over the season mostly thanks to an average attendance of 900. i don't think i've ever done this challenge with such a well supported club. The squad was quite strong from the start with, although with no wingers or decent GK. Kealy left after 10 games which was a blow although i did sign Adeloye who was my best player, Eccles also did well in midfield. 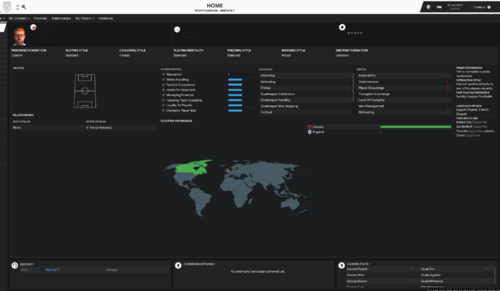 I have updated the related games and did some brush up to the linked SI pages, so it should be ready for action. Hahah, I've never actually completed this challenge though... So I think I'll stick with Kettering! I've never done a Dafuge challenge before, but I think I fancy joining you guys this time. 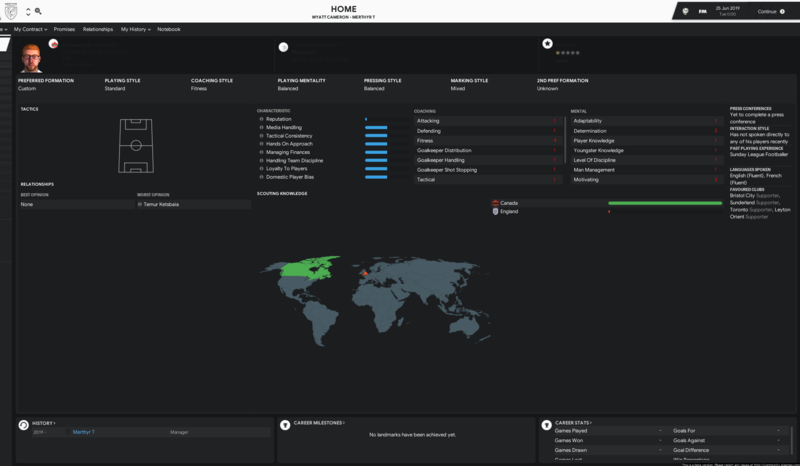 I don't have the beta so I'll start with the full-fat version and keep reloading until Gainsborough Trinity pop up. 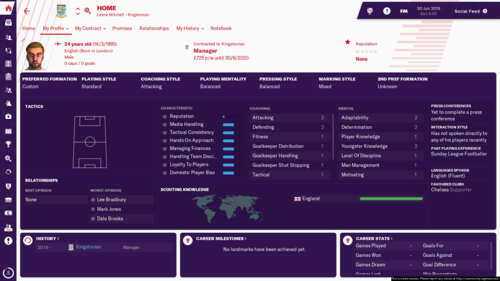 I'll join XaW in a Youth Academy challenge - that's how I always play with lower league files as I prefer bumbling about at the bottom to success. In the meantime KUTGW chaps! Sure, but having just read through the Academy Challenge thread, that might be more appropriate. Got a few days to mull it over. Bit naughty you doing both! Even better than Gainsborough would be Brightlingsea Regent as I grew up in a nearby village. Can't see them getting promoted though. I'm a rascal! 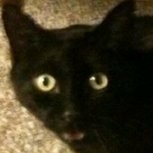 I thought I'd update on both threads, because why not do so. I'm always doing both challenges anyway, so when I chose England I thought I'd update both at the same time. Good on ya! Stupid me has gone and bagged a proper job starting next Tuesday so don't expect me to keep up with you! That's just poor planning. 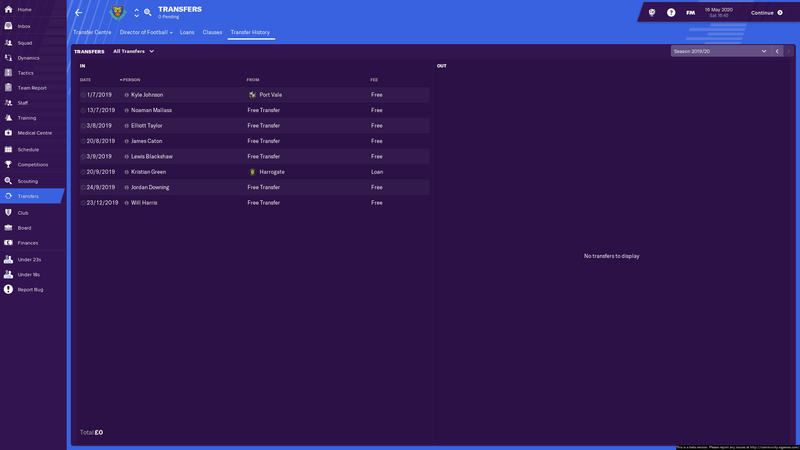 Getting a new job around the FM-release... Pfft, who need food or money when FM is released! I was so hungry I didn't think it through! What's worse, my sugar-mummy wife is off on a business trip to Japan for a week - returns the day the game is released. Doh! So you have everything in order to sit in a dark room playing FM alone for a week, and you didn't pre-order to get access to the Beta? What are you doing with your life, man! I'm on a losing streak! I'm no Mourinho though; I'll turn it around - you'll see! Finally, after over 30 reloads, here we go! Up the Bucks! I'm sure my toys will be out of my pram at some point. Probably when I'm three years in and no better than mid-table. 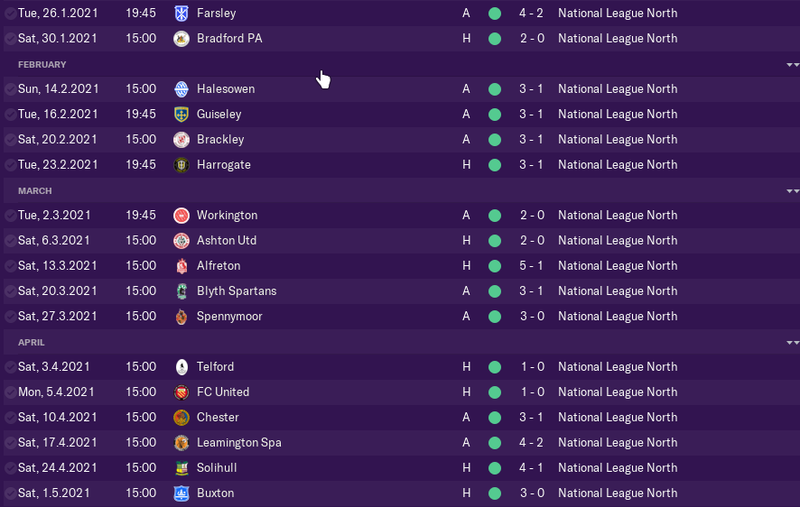 On my Farsley save it took me 4 years to get out of the North division, but then I had 4 straight promotions. I'd gladly take the same again. Let's give this a whirl with Lancaster. it usually takes me 3 or 4 years to get promoted. however the board wanted to avoid relegation in the first season but in the 2nd want playoffs at a minimum so it will be promotion or bust by 3 years. 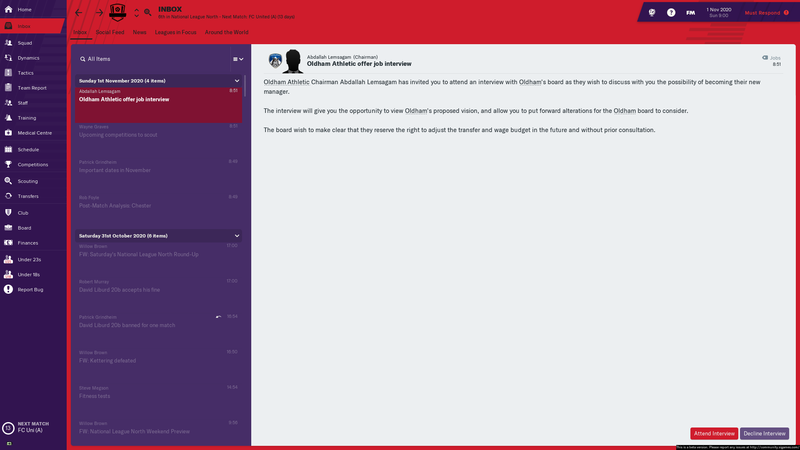 Wow, that's tough, my board just wanted to avoid relegation again! My squad is weaker this season and i started by losing the first 2 games. Won the 3rd game and in the 4th i was away to the title favourites. After 20 mins they were 2-0 up and had missed a penalty when i realized i was using my home tactics rather than my away tactics . Trying this challenge for the first time. 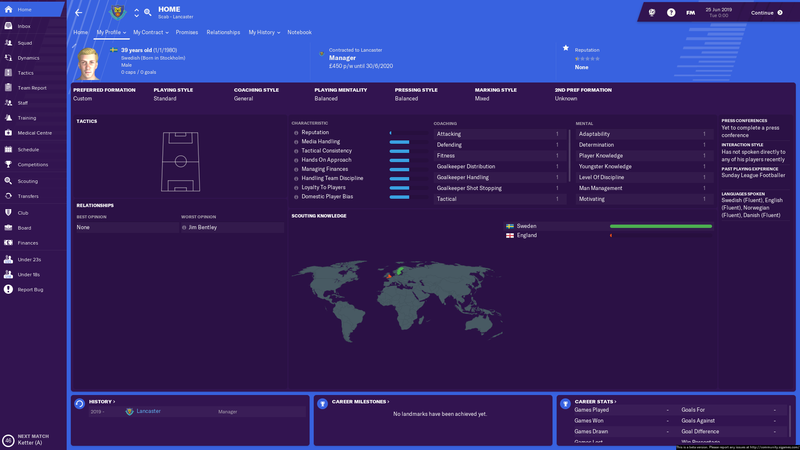 Starting as Lancaster City, to be managed by Mr Guillermo. 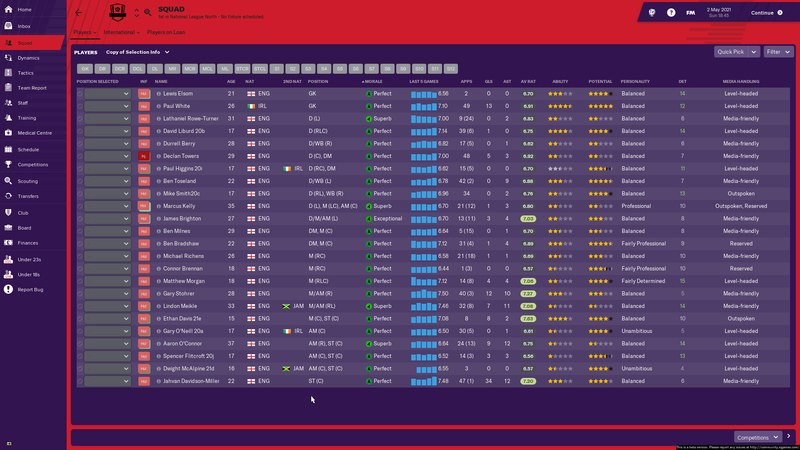 I appear to have a ridiculous amount of Central Midfielders compared to the depth in other areas of my squad. I'm happy to see that I have a squad with generally high levels of natural fitness and decision making. 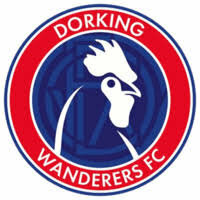 In what turned out to be another fantastic season for Dorking, we managed to seal a place in the football league via the play offs. It was a weird season, with spells of great form and some terrible spells. The league was tight all season with the exception of runaway leaders Gateshead, and we were never really in the promotion hunt until the last 8 or so games. Even then we tried to throw it away with 2 0-0 draws in our last two league games. Finishing 6th I never really thought we would go up but we did. 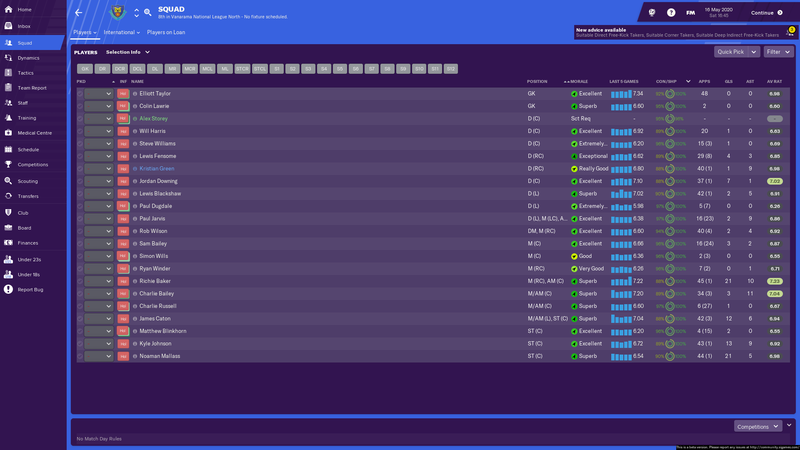 I am worried it has all come too soon as our current squad will struggle in League 2. In the FA Cup we got to the 2nd round where we lost to Wallsall and in the FA trophy we got all the way to the final before suffering the agony of a penalty shootout loss. Another summer of mass trialling and a step up in class meant it was vital to sign players. We signed a total of 22 players. Losing 2 of our starting 11 around February to bigger teams. We've also already started planning for next season, with 3 young, highly talented kids Signed for next season. The Youth Intake was once again rubbish. Even though we have gained back to back promotions, id be amazed to make it 3 in a row. 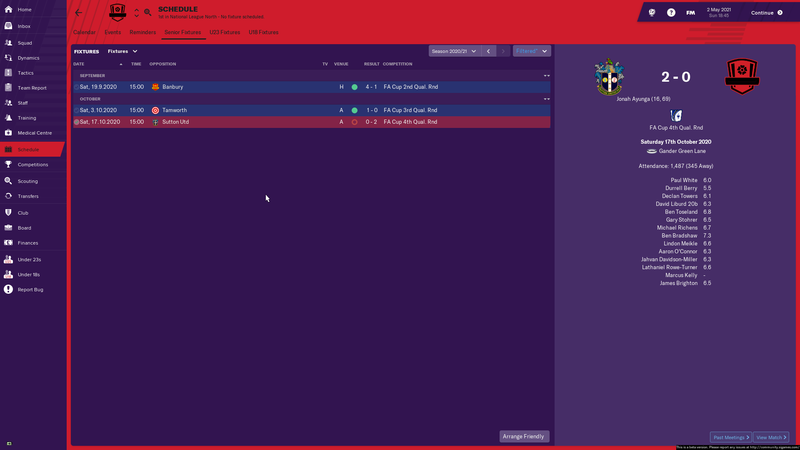 With a low wage budget, low rep and a squad not good enough for League 2 (we was 6th in the VNL), its going to be a long summer trying to improve the squad on a shoestring. 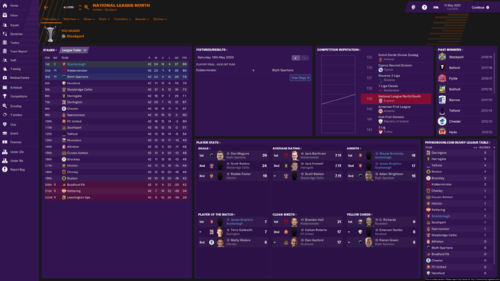 The only aim for next season is to stay in league 2. 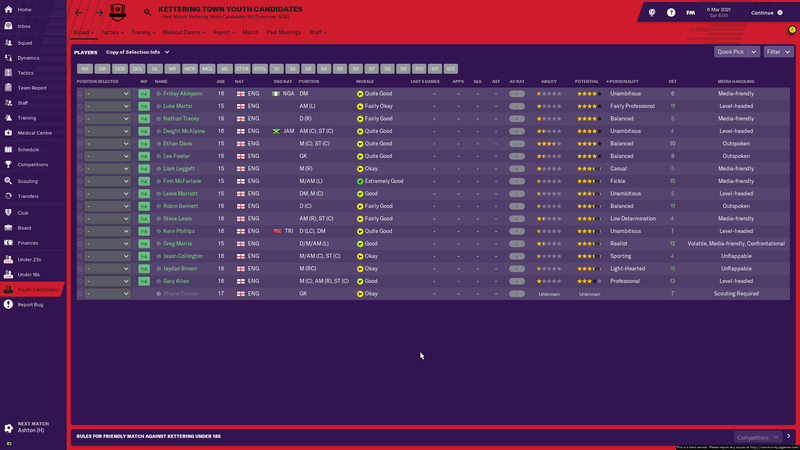 Has anyone had Taunton Town come up?? 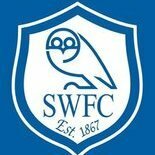 So close to playoff last season and with the youngsters keep getting better, I hoped we could do something around the same, maybe sneak in a cheeky playoff spot or something. However, we started horribly not winning for the first 5 matches. I took a long look at the tactic, and came to the conclusion that my possession-based 4-1-4-1 were not particularly suited for this level of football. So, what works in the lower leagues in England? 4-4-2 Hoofball! So I went back to the basics to try to hoof the ball over the defense and our quick strikers can run after it. And lo and behold, it works! We started winning again and slowly crawled up the table and suddenly we were part of the battle at the top. 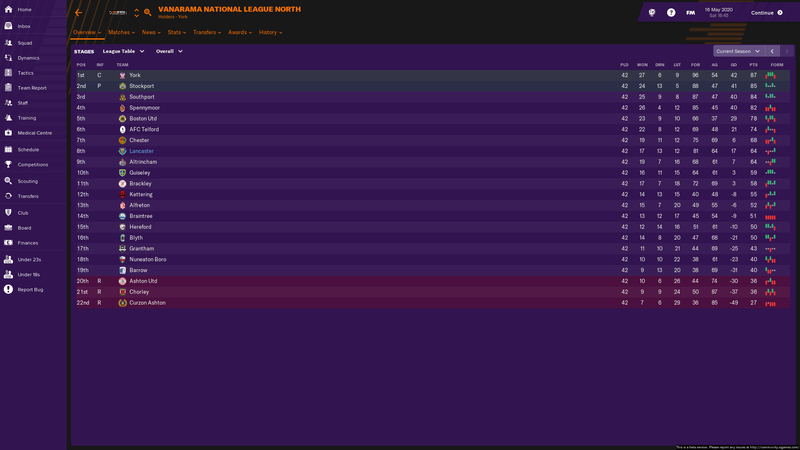 Around Christmas we were placed nicely in the playoff spots, a bit behind Southport and Blyth Spartans. Then we went on the greatest run I've ever done in FM. From January 26th until the end of the season, we won all our league matches! Naturally, this boosted us further up the table, and in the end we won the whole thing! National league here we come! 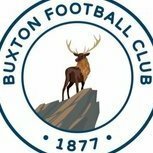 In the FA Cup we got to the 4th qualifying round before getting knocked out by Sutton Utd. 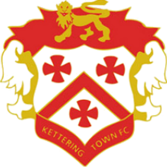 In the FA Trophy we made it to the 4th round again, beating Morecambe (who won the national leauge!) before getting knocked out by Aldershot. And we are once again expanding the stadium. 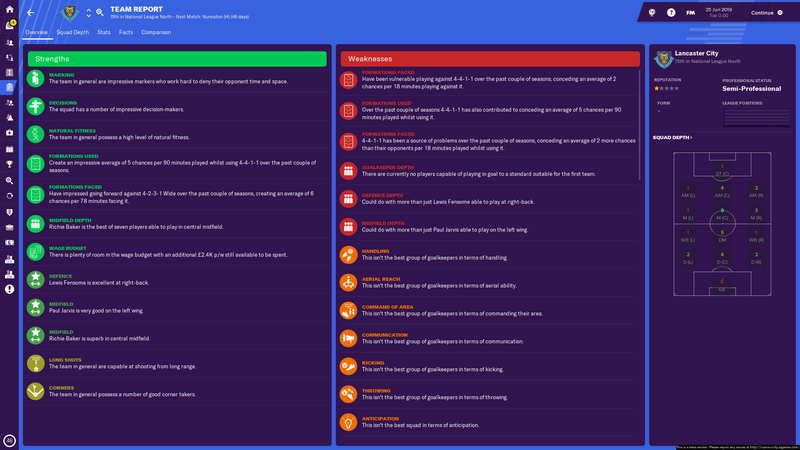 I had an amazing youth intake this season with a lot of good youngsters, the best of them is Ethan Davis 21e. 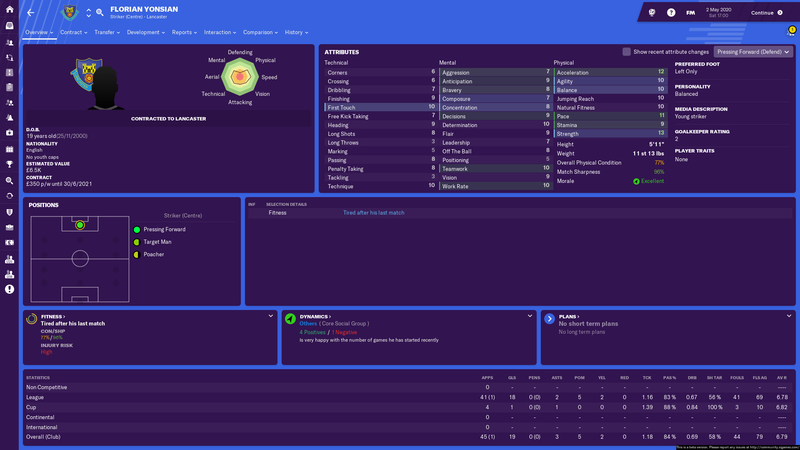 He went straight into the first team and have scored 8 goals in 8 games! Financially we have proven to be in a better position that I thought we would. 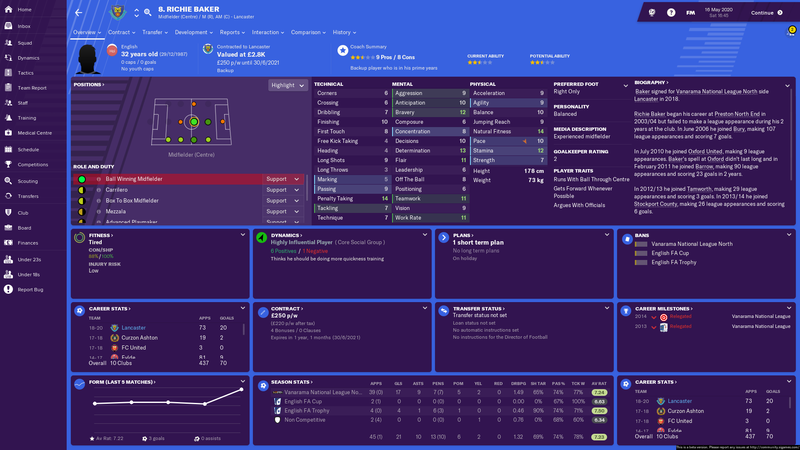 After another summer of 100+ trials, we made some good Signings. I wasn't very positive at the start of the summer but our business has been good, still could do with a starting Cb and GK but apart from that we have a pretty well equipped Squad for a battle to stay up. The bookies still have us as favourites to go down, but I cant see why we cant push for a mid table finish at the least. First game against relegated Wimbledon has only reinforced this further, a thumping 6-1 away win. With new signing Neil Wright scoring 4 on hes debut. 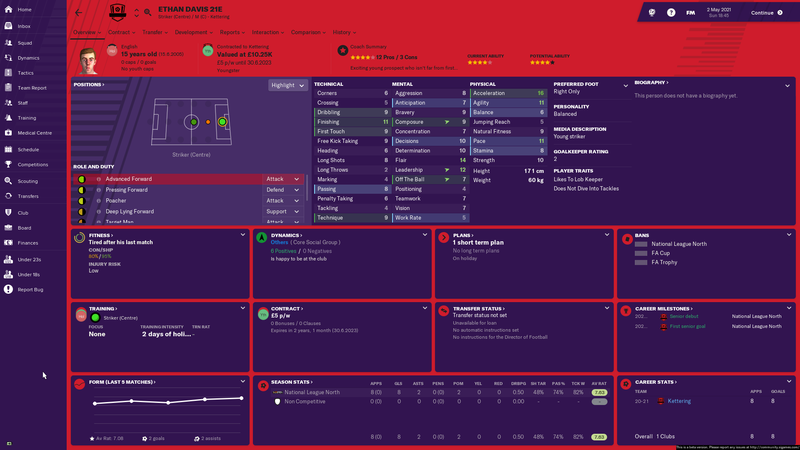 Signed for £9.75k he could be key to us having a successful season. probably unlikely, they are going to be as rare as it gets - i did about 100 reloads and saw not one team below about 1800 come up and most teams under 2000 only came up once or twice. it may be if you holiday 2 or 3 seasons in, they may be more likely to appear. Won my first league game and am now officially terrified to fire the game back up in case I rage quit after no-doubt losing the second 0-6. Went for a 4-2-3-1 focusing on crossing onto a target man. Will attempt to plough through a season this weekend. Not bad. I'll take 8th. I may have spent an embarrassing amount of time cursing at the screen in response to the awful football on display, but hey — we made it work. I'm still grappling with the new training and some of the new screens, so I should be able to build from here. I hope. Also... Um, surprise! We have a new chairman already! £7K the media says we're worth, though the bank loan is actually for a little more than that. Fine by me. Also... Um, surprise! We're building a new stadium! Yes, really. No, I don't know what they're thinking; I'm too busy fighting off panic attacks from imagining 20 years stuck at a ~5K capacity ground. Nothing too exciting here. I play a pretty straight-forward flat 4-4-2 and employ pretty straight-forward players for it. Baker does probably deserve a mention, what with scoring 21 goals (7 pens) from his MR position. That's on par with my best striker while providing almost as many assists as my best central midfielder. I'd say that deserves a contract extension! Aim for next season: Reach the playoff spots. League Table - Another productive season as we finished sixth in Vanarama National League. Unfortunately we lost playoff 1st round to Leyton Orient . We were the top scorers in our division but our defence was too leaky and that was the biggest reason why we didn't finish higher. That's definetly something that we have to address going forward. Cups - We were terrible. Especially FA Cup home defeat versus National League North side was embarrassing. Transfers - Good business here. We made solid profit. Finances - Still strong. Without player sales we would have been break even but now we turned profit second year in a row. Steve Cattermole - Luckily he agreed to sign new contract. He bossed midielf once again and thanks to his strong performances we sold him to Hull in January transfer window but part of the deal was clause that he would be loaned back to us till the end of the season. Luke Brennan - 29 goals. 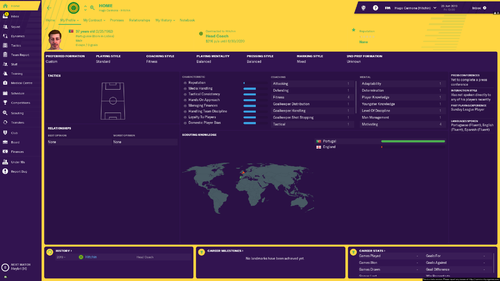 Signed him on free, sold to Burton in January transfer window and loaned him back immediately. George Green - 15 goals from AMC position. His average rating is a bit low but it seems that AMCs get low ratings unless their score or assist a goal. However I was pleased what i saw. His flair is exceptional at this level. 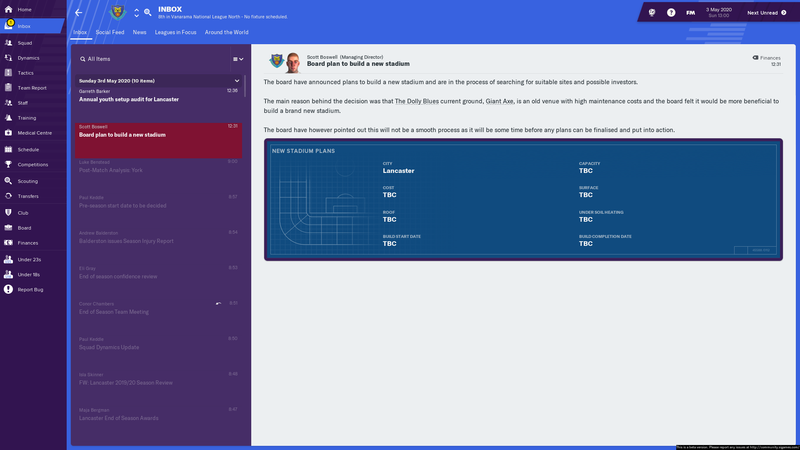 Hopefully I can make another promotion push. Lots of our contracts are expiring and I won't be reneving them. 2/3 of the squad including all our CBs will be released so it will be busy preseason. I am 1 and a half seasons in now, i have noticed that not one player has increased in any attributes beyond determination, in fact most have decreased slightly. I know the club has only basic training and it is part time but most of the players are young and some have played quite well in 40+ games. Is anyone else noticing the same? 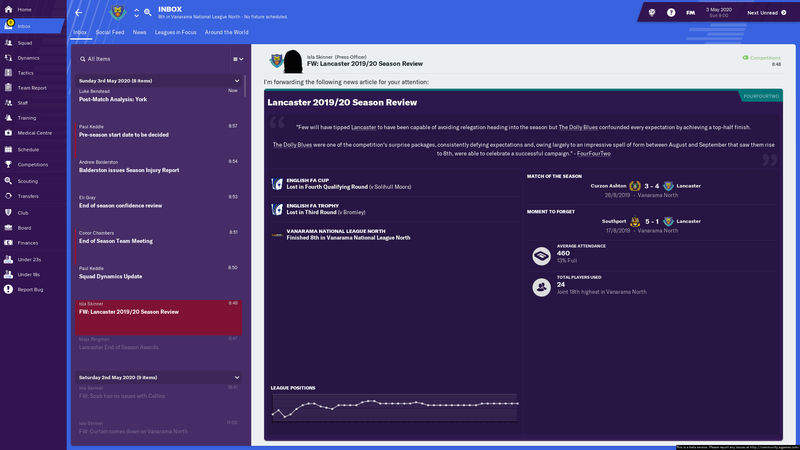 As I mentioned in my previous post, I am terrible with tactics on FM and that showed in my first season at Lancaster City, where we survived relegation on the final day of the season by the skin of our teeth. Thankfully, there were 3 teams worse than us in the league. We were on our way to relegation until I changed tactics in the last few games, deciding to go for a more positive 4-4-2 formation. I was struggling for goals in my counter 4-4-2 (which was also leaking goals) so I felt I really needed to go for it. You can see that my squad played below average for most of the season. I have a lot of strengthening to do in the summer. 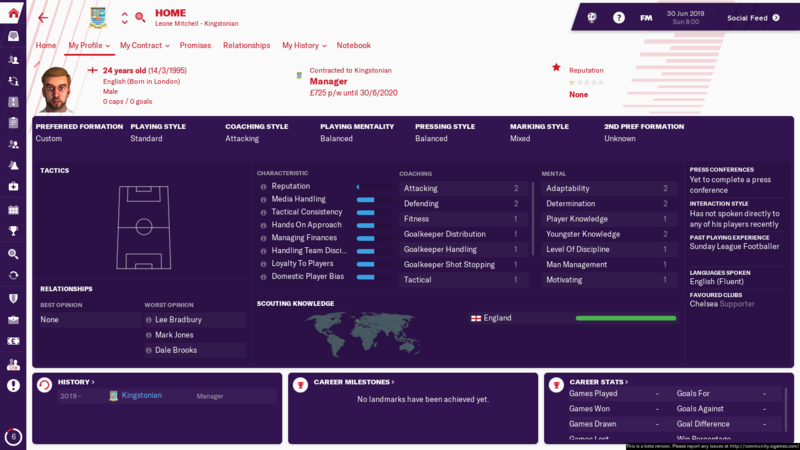 The man who saved my season is young striker Florian Yonsian. Without his goals, we would've finished dead last. Thankfully he has signed a new deal until next summer. Despite this being a highly infuriating save at times, I'm having a lot of fun and it's a huge challenge for someone not so good at FM like myself. I think next season will be about avoiding relegation again.